Last month Golden and Diamond Graduates from the classes of 1950 and 1960 returned to Washington State University in Pullman, Washington as guests of the Alumni Association. The reunion spanned April 28–29, 2010 and included a variety of events all over campus. Alumni had an opportunity to tour WSU; meet current students, faculty, and staff; get a glimpse into some of the research being done here on campus; and reconnect with old friends. The College of Engineering and Architecture (CEA) tour began with student presentations. Afterwards, alumni were welcomed by Dean Candis Claiborn and enjoyed lunch together with CEA students, faculty and staff. The rest of their time in the college was spent touring including a tour of the Unit Ops lab. 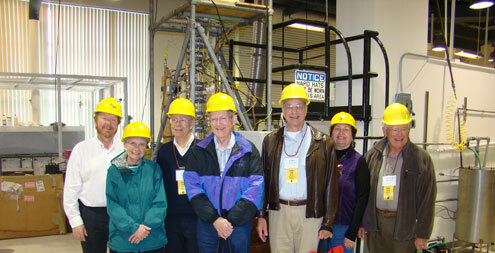 As undergraduates, the alumni in the photo above spent many hours working together in the old Unit Ops lab. Thank you to everyone who attended and to everyone who helped organize this memorable week at the WSU campus. David Ensor went green before it was cool. One could say he was on the environmental bandwagon early when no one could have foreseen it would be a major trend over the next four decades. Ensor was recently honored with the Gene and Linda Voiland School of Chemical Engineering and Bioengineering Distinguished Alumnus Award. After graduating with a bachelor’s in chemical engineering from WSU in 1963, he got his master’s and Ph.D. at the University of Washington. It was while in graduate school that Ensor decided to use his chemical engineering training in the environmental field. He also met his wife, Sally, who was a student in the Department of Library Science at the University of Washington. His career choice made sense to her because “Basically, he was either outdoors hiking and mountain climbing or studying and working in the lab,” she said. Ensor went on to become an expert in aerosol and air pollution science. In recent years, he has been applying his aerosol expertise to nanotechnology research and international standards development as a United States delegate to the International Organization for Standardization (ISO). His work has ranged from some of the first air quality projects in Southern California to recent research into how indoor air filters work. He worked for Meteorology Research Inc of Altadena, CA and is currently employed by RTI International in North Carolina. During the last 38 years, he has managed departments and centers performing projects for EPA, Department of Energy, Department of Defense, Department of Homeland Security, Electrical Power Research Institute, and private corporations. Currently as a RTI Senior Fellow, Ensor is editing a book about the history of aerosol science in addition to his research responsibilities. He has several patents, almost 200 publications, recognition as one of the Founding Editors-in-Chief of Aerosol Science and Technology, and several prestigious awards, including the Hammer Award from the White House during the Clinton Administration and the Meritorious Service Award from the American National Standards Institute. Ensor credits a variety of things for his success, including a high school shop class that taught him about designing projects and finishing them, the importance of a strong work ethic, and how to draft technical plans. “It’s not about which classes you take, it’s what you get out of them and how you apply them,” he said. Although he moved on, he also always remembers the impact of WSU. In particular, he credits former CEA faculty member and the first Chemical Engineering Department Chair, George Austin, with inspiring him to move into environmental research. 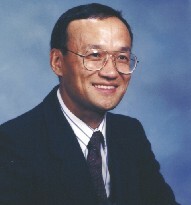 Dr. James Lee, a chemical engineering professor for almost 30 years, passed away in April from lung cancer. Lee’s research into cancer treatments may have played a role in ultimately extending his own life, says Jim Petersen, director of the Gene and Linda Voiland School of Chemical Engineering and Bioengineering. Lee, who was a non-smoker, conducted research in using tobacco leaves to produce proteins used in cancer treatment, producing tobacco cell cultures that contained mammalian proteins. The researchers chose the tobacco leaf because it was fast-growing and had been extensively studied, not realizing the irony of their choice until later. In particular, the researchers produced proteins used for communication between blood cells and for the production of colonies of white blood cells, both of which are thought to play a role in immune response. They also produced a protein that could be used in diagnostic laboratory tests. Lee hoped that the use of the plant-based protein production would lead to less expensive and more effective cancer treatments. Not only a researcher while at WSU, Lee also enjoyed teaching and maintained a focus on his students. He wrote a well-used textbook on biochemical reaction engineering. Lee, who was born in Seoul, South Korea in 1946, received his master’s degree there in chemical engineering. With his wife, Inn Soo Sohn, and his daughter, Young Jean, he came to the United States in 1976. 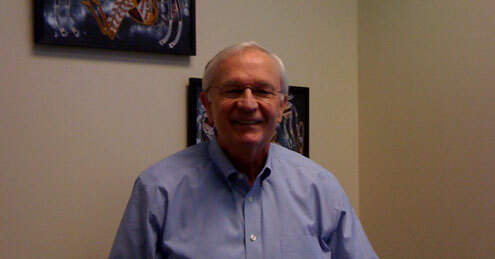 He received his doctorate from the University of Kentucky and began teaching at WSU in 1983.